Ornamental grasses work very well in a border. They bring a sense of tranquillity and at the same time lend natural movement to the overall look. They also work well because of their colour and fine structure. Grasses are decorative almost all year round. There are a host of varieties and shapes to choose from. Giant feather grass (Stipa gigantea), is very attractive and its broad shape and elegant stems mean that it fits in well amongst perennials. Plant short grass varieties at the front, taller ones more in the background, as you would do with perennials. Do not be too linear - bring a slightly larger shape forwards here and there. This will make the overall appearance more lively. Ornamental grasses are also attractive in the winter, particularly when the sun shines on the ripe stalks. Using grasses of varying height creates a dynamic feel. Tall grasses are magnificent and often have plume-like habits. The smaller varieties can also be used in groups, whilst the larger (such as pampas grass, Cortaderia) are also very decorative as solitary specimens. Combine grass varieties which offer foliage of various shapes and colours with perennials. Vary those shapes so that there is always a strong contrast present. That lends excitement to the overall picture. 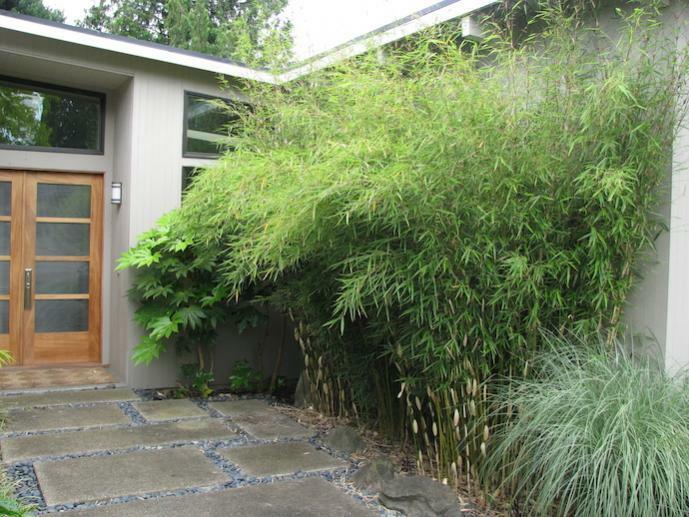 Bamboos are classified with both the grasses and the shrubs. In fact they are grasses, but their woody stems with ‘joints’, sometimes bizarre shapes, very fine colours and usually narrow evergreen leaves mean that they still constitute a group apart. They thrive in virtually any spot in the garden and in any type of soil. Please note, many bamboo varieties do require space. They often spread widely and can easily reach heights of three to four metres. One disadvantage of many bamboos is that they tend to start rampaging. The best option is clump-forming varieties such as Fargesia, which do not rampage. Make sure you get good advice when you make your purchase.